The mission of the Soyuz TMA-14 (No. 224) spacecraft, taking off in the spring of 2009 had a goal of delivering the 19th long-duration crew to the International Space Station. The launch of the Soyuz FG rocket was scheduled for March 26, 2009 at 14:49 Moscow Time. During the flight to the station, the Expedition 19 crew was joined by an American "spaceflight participant" Charles Simonyi flying under a commercial agreement with the Russian space agency, Roskosmos. He would return to Earth with Expedition 18 after 12 days in orbit. Aerospace Exploration Agency Joined Expedition 18 in progress. He replaced Sandra Magnus during STS-119 and to serve with Expedition 19 and 20 as well. 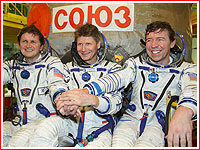 Charles Simonyi Tourist US, private Up only; returns onboard Soyuz TMA-13. The new expedition is heading to the International Space Station, ISS, Thursday, in preparation for expansion of its crew from three to six. The Soyuz FG rocket blasted off from Site 1 at Baikonur Cosmodrome on March 26, 2009, at 14:49 Moscow Time, carrying the Soyuz TMA-14 spacecraft. Onboard were members of Expedition 19 -- Russian cosmonaut Gennady Padalka and NASA astronaut Michael R. Barratt, along with an American space tourist Charles Simonyi. After a two-day autonomous flight, Soyuz TMA-14 docked to the the aft port of the Zvezda service module of the ISS on March 28, 2009, at 16:05 Moscow Time (13:05 GMT). However due to problems with the flight control system during the final phase of the rendezvous, Padalka had to switch to the manual control of the Soyuz. 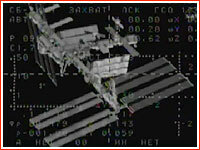 Originally, the docking was scheduled for 16:04:49 Moscow Time. From immediately available information, it appeared that at the distance of around 100 meters between two spacecraft, the automatic control system onboard Soyuz detected abnormal performance of one of rendezvous and docking thrusters, known as DPO, and commanded the Soyuz to back away from the station. Russian flight controllers then instructed Soyuz commander to switch to manual control at the distance of around 200 meters and he completed docking flawlessly. During a post-docking press-conference, Vladimir Soloviev, the head of flight control team in Korolev said that the flight control computers were over-sensitive to the deviations in the work of the DPO engines. 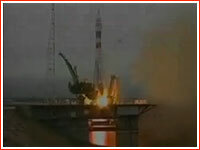 Hatches between two spacecraft were opened at 19:36 Moscow Time (18:36 GMT). Padalka and Barratt are expected to spend about six months onboard the outpost, while Charles Simonyi should return to Earth onboard the Soyuz TMA-13 with the members of Expedition 18. During their stay in orbit, Padalka and Barratt will be joined by three more crewmembers for a long-duration stay onboard the station. It will be the first time, the outpost's permanent crew would reach six people, which ISS developers believe are needed for the full-scale use of station's research capabilities. International Space Station commander Gennady Padalka and flight engineer Mike Barratt worked outside the station on June 5, 2009, preparing the Zvezda service module's transfer compartment for the arrival of a new Russian module. A spacewalk started on June 5, 2009, at 3:52 a.m. EDT. after a considerable delay, as Russian ground teams analyzed data from the Russian Orlan spacesuits that showed slightly high levels of carbon dioxide. The spacewalkers said they felt fine and were eventually allowed to proceed with planned work. Padalka, the lead spacewalker or EV1, was wearing the suit with red stripes. Barratt, EV2, was wearing the blue-striped suit. It was the seventh for Padalka and the first for Barratt. The spacewalkers installed docking antennas, a docking target and electrical connectors for the Kurs automated rendezvous equipment. Barratt then rode on the end of the Strela boom, a manually operated crane, to take photographs of the antennas. This outfitting of gear is in preparation for the arrival of the Russian Mini-Research Module-2, or MIM-2, in November 2009. The MIM-2 will dock automatically to the zenith port of Zvezda and will serve as an additional docking port for Russian vehicles. Flight Engineer Koichi Wakata was assisting the spacewalkers from inside the Zvezda service module. The spacewalk was expected to last five hours, 32 minutes and actually concluded at 8:46 a.m. EDT. On June 10, 2009, at 3:07 a.m. EDT, commander Gennady Padalka and Flight Engineer Michael Barratt completed an internal spacewalk, NASA said. 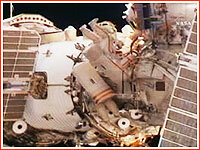 Padalka and Barratt replaced a cover on Zvezda’s zenith docking port with a docking cone. The excursion took place internally with the spacewalkers attached to umbilicals in Zvezda for life support. It lasted about 12 minutes. The excursion was the shortest of the 125 spacewalks in support of station assembly and maintenance. It was conducted eight years and two days after Jim Voss and Yury Usachev of Expedition Two conducted a similar internal spacewalk in 2001 to position the same docking cone to the nadir port of the Zvezda transfer compartment in advance of the arrival of the Pirs Docking Compartment. Docking antennas, a docking target and electrical connectors were installed on the exterior of the Zvezda service module when Padalka and Barratt completed their first Expedition 20 spacewalk Friday. The station is now ready for the docking of the Mini-Research Module-2, or MIM-2, later this year. The MIM-2 will dock automatically to the zenith port of Zvezda and will serve as an additional docking port for Russian vehicles. After reconfiguring the station for normal operations, the crew began an extended sleep period around 8:20 a.m. A wake up time of 2 a.m. Thursday will set in motion preparations for the arrival of the STS-127 crew early next week for 11 days of joint docked operations. Endeavour and the STS-127 crew are scheduled to launch to the station Saturday, June 13, bringing with them the Kibo Japanese Experiment Module Exposed Facility and Experiment Logistics Module Exposed Section. They will also bring astronaut Timothy Kopra, who will take Flight Engineer Koichi Wakata’s place aboard the orbital outpost. The Soyuz TMA-14 spacecraft undocked from the ISS on Oct. 11, 2009, at 05:07 Moscow Time, as planned. It carried onboard members of the 20th long-duration crew Gennady Padalka and Michael Barratt, who spent 198 days in space, along with a space tourist Guy Laliberté, who arrived to the station with the Soyuz TMA-16 crew. An engine firing to deorbit Soyuz TMA-14 was scheduled for 07:40:43 Moscow Time and was expected to last for 259.5 seconds. After slightly more than a three-hour autonomous flight the descent module of the Soyuz TMA-14 landed in Kazakhstan on Oct. 11, 2009, at 08:31 Moscow Time. The touchdown took place at the nominal landing site near the town of Arkalyk.